Have you ever wondered what your company’s food footprint is? 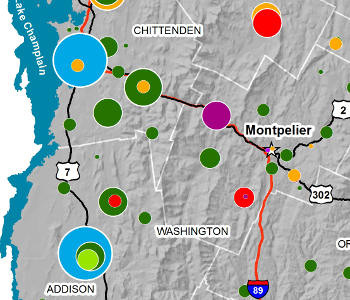 Wish you could make a map of suppliers, farmers, or potential customers? Perhaps you’re interested in assessing the economic benefit of sourcing more food regionally? Looking at your data on a large scale makes sense; FSRI’s Market Analysis & Analytics services help you see information in a new way and allows unrealized patterns to emerge. The result: more informed, and ultimately, profitable decisions. FSRI’s goal is to enable our clients to make better decisions. Whether you are looking for internal decision support mechanisms in the form of a Geographic Information System or developing material for precision customer targeting, FSRI has the enterprise-level analytical capabilities to help you move forward.